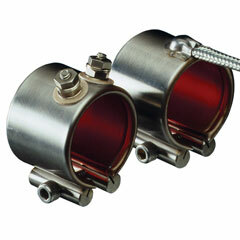 The MI nozzle heater from Watlow® is a high-performance heater. The nozzle heater's performance and name are derived from Watlow's exclusive mineral insulation—a material with a much higher thermal conductivity than mica and hard ceramic insulators used in conventional heaters. A thin layer of the “high” thermal conductive MI material is used to electrically insulate the element wire from the inside diameter of the heater sheath. A thicker, “low” thermal conductivity layer backs up the element wire, directing the heat inward toward the heated part. The result is more efficient heat transfer—a performance solution lowering element wire temperatures and increasing heater life.